Mucha went all out with a most opulent design. 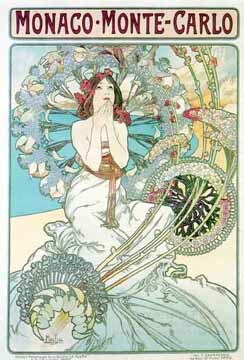 The shy maiden, kneeling, enraptured with the tranquility of the bay of Monte Carlo, is completely encircled by the curving stalks of lilac and hydrangea, featuring some of the most intricate conflorescences ever painted by Mucha. Since the client with a railroad - Chemin de Fer P.L.M. - it is probable that the design is meant to suggest the tracks and wheels that convey the public to Monte Carlo. The maiden is probably Spring herself, enraptured with the beauty of the seascape.